Built in the 1950s in the "Old Town of Dillon," the historic home of the Moose Jaw began as a bunkhouse for the workers who built the Dillon dam and reservoir. Split in half, moved and reconstructed in Frisco in 1961, the building became the first supermarket in town. Through the years it served as a furniture store, and later, a donut shop. 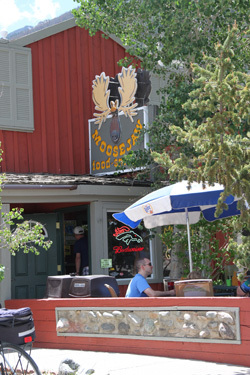 A succession of various cafes followed, until in 1973 the Moose Jaw moved in. In its early days it drew a diverse clientele of hippies, cowboys, bikers and yuppies — a combination resulting in the occasional brawl. Still run by one of the original owners, today the Moose Jaw offers up burgers, beers and an unpretentious vibe on Frisco's main street. It remains a refuge for locals and drifters alike, embodying the mantra of its sign that reads, "Be nice or leave." If you're here you already know the Moose Jaw is the place in Summit County. Bought one for a friend and myself!